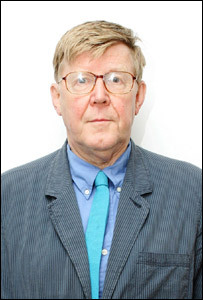 Alan Bennett, author of award-winning play The History Boys, has called for private schools to be banned. He said abolishing private education would be unpopular, but it was worth it because the schools cause "a fissure running through British society". He added: "Buying advantages for your children over and above their abilities is wrong." The Independent Schools Council rejected his stance, saying private education was a "human right". The row comes as arguments continue over the charitable status of public schools - which some critics say amounts to a state subsidy for rich fee-paying parents. Mr Bennett's successful play, which tells the story of a group of grammar school boys trying to get into Oxford and Cambridge, has reopened in London's West End. Speaking on BBC Radio 4's Today programme, Mr Bennett described the abolition of fee-paying schools as the "elephant in the room" that no-one would talk about. He said: "I think quite plainly the public school should be abolished. How they will be abolished I don't know, without enormous disruption. But the English are so hypocritical about it." He said he had first formed his views when he went to Cambridge in 1951 to take an entrance exam. He said: "It was the first time I ever came across boys from public school. They were so confident. We were timid grammar school boys but they were very much at ease. "They hogged the bread and slurped the soup - things were very much still rationed in those days. "They were just louts, but I also realised that they had been better taught than I had. I thought that was unfair when I was 17, and that view has never changed." He said he admired the education system in France, where "state education is the best." He added: "If the state schools here in Britain were the best and you had to compete to get into them, then the whole nature of education would be transformed. "It's the paying: it's the fact that you can buy advantages for your children over and above their abilities than seems to be wrong. "If there wasn't this option to go private with education, then the whole atmosphere of the whole country would be better." Mr Bennett's view were immediately condemned by the Independent Schools Council, which represents nearly 1,300 fee-paying schools in the UK. Chief executive Jonathan Shephard said: "There is a huge and stable demand for the education of the individual child. "The strength of the schools in the independent sector is that we educate all levels and abilities very effectively." He rejected Mr Bennett's call for a ban saying: "It is a human right for parents to educate their children free of the control of the state and we are defending that right."